There are certain definitive instances in each Doctor’s timeline where he must confront the prospect of potentially altering the course of history for better or for worse. For Tom Baker’s Fourth Doctor, his most famously came in ‘Genesis of the Daleks’ when confronted with the opportunity of forever ridding the universe of the Dalek menace before it even had a chance to substantiate itself. 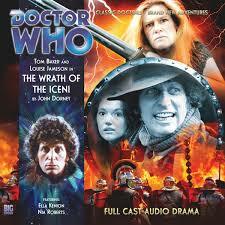 ‘The Wrath of the Iceni’ provides another such moment for the Fourth Doctor as he and Leela travel to Britain at the time of Boudica’s rebellion during the Roman occupation, soon finding himself having to decide whether to save history or his companion. ‘The Wrath of the Iceni’ follows a fairly generic formula as Leela insists that the Doctor and she can help to make a meaningful difference as she comes to understand the state of affairs around her at this crucial period in Britain’s history. When the Doctor refuses to interfere on her behalf, the close relationship between the two is strained almost to the breaking point, the fact being that history must run its natural course. However, what makes another journey down this familiar path so particularly enjoyable here is that for once the companion is much more in her comfort zone than the Doctor is in his as the Iceni rise up in revolt, allowing a unique angle on a very familiar concept to take hold. With the Iceni seeing their lands stripped away, their riches plundered, and their men murdered, the warrior Queen Boudica quickly draws the attention of Leela as she attempts to rise up against her Roman assailants. However, Leela soon finds herself torn between loyalties as the Doctor, normally a fighter of oppression across the universe, refuses to help Boudica who is fighting the oppression of the Romans. The Doctor knows exactly what history has in store for Boudica and her warriors, but even under torture he refuses to reveal their grisly fate at the approaching Battle of Watling Street. That said, Leela very much takes centre stage here, and the presence of Boudica highlights just how non-savage Leela truly is. The characterization of Boudica, while probably historically accurate, as an unbalanced lunatic evoking no sympathy makes it difficult to believe that Leela would so willingly stand by her side given her experiences, but Louise Jameson takes total command of every scene she is in to convey the always-shifting excitement, fear, and questioning of Leela. ‘The Wrath of the Iceni’ is a brutal story both from an action and characterization standpoint, and the actors and sound design reflect this strife wonderfully. Big Finish has not shied away from the gory history of Britain at all in this release, and the physical violence comes to life incredibly realistically in the audio medium. This is not a romanticized notion of the past, and Big Finish’s willingness to tread into murkier territory makes this the strongest of The Fourth Doctor Adventures range yet, at the same time taking the Fourth Doctor and Leela beyond their usual innocent banter into territory that reveals just how much they do truly care for each other as friends despite their inherent differences.